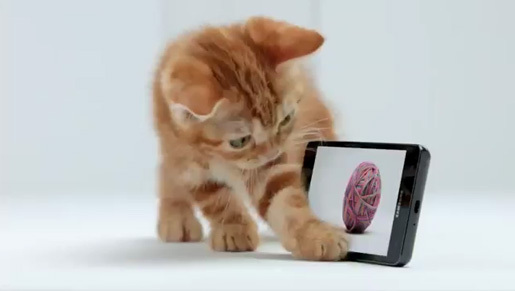 AT&T is promoting the new Samsung Infuse 4G smartphone with a series of television commercials featuring cute animals. Three screen tests use a kitten, a frog and a goldfish to reveal the insight, “Colors so real, it’s almost unreal”. Cute rather than creepy. The Infuse campaign was developed at BBDO New York. Filming was shot by director Mason Nicoll. Editing was done at Final Cut. Grading and post production was done at Smoke & Mirrors, New York.